Oh HalfPops. I last reviewed them in 2012, but I've had them many times. I keep giving HalfPops more attemps, because I really should love this product. I love snacks. I love popcorn. 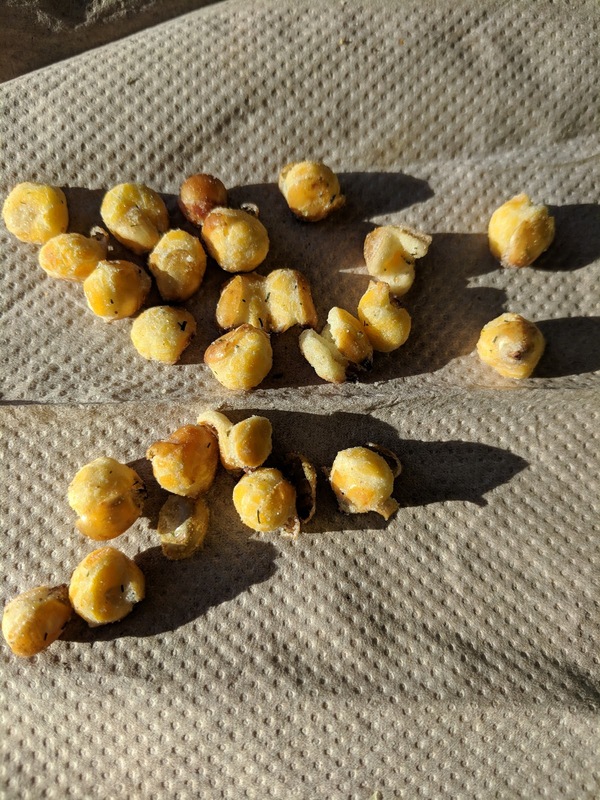 I'm the girl who eats all the kernels in the bottom of the popcorn bag, and loves naturally half-popped popcorn. But HalfPops? Meh. Even when they make incredible flavors. Such a shame. Black Truffle & Sea Salt. "We couldn’t help but get a LITTLE FANCY with one of our flavors. We know truffle is a little more unique, but it’s probably our most addictive flavor." Great flavor. I like truffle. It was almost even somewhat "cheesy". But ... 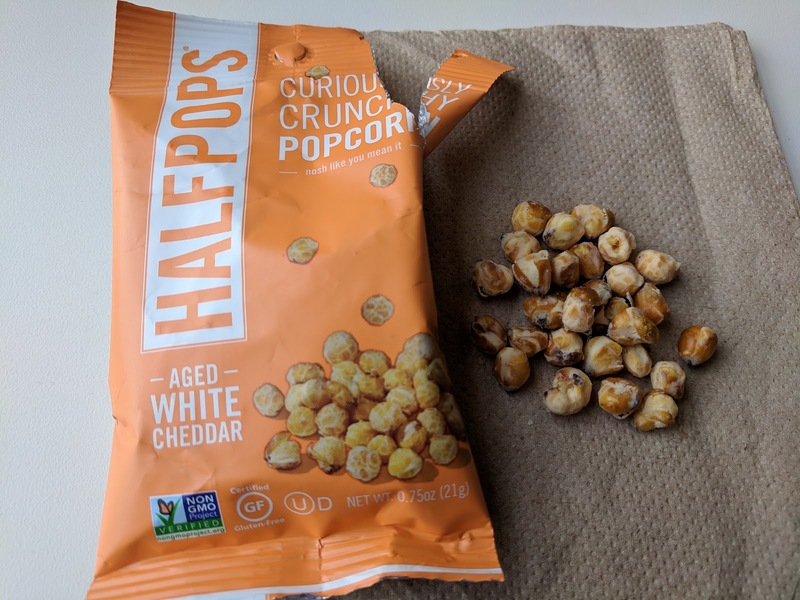 I don't like HalfPops! Which just makes no sense, because I really, really should love them. But they were just crunchy and dry. "How can you possibly improve on a pickle? Take away the jar, harness the QUINTESSENTIAL PICKLE FLAVOR and pack it with plenty of crunch." I still kept trying more varieties. Dill pickle flavor! How could I not? I love pickles so much. I want to love Halfpops so much. And the verdict? I hated these! 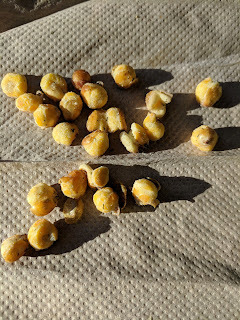 I still did not like the format, the half crunchy not quite popcorn nor corn nuts that I should I love. And this time I hated the flavor too. Yeah it was dill-like, but, it most certainly was not for me. My least favorite of any variety I tried, which is sad, as it sounded so promising! Natural Butter & Pure Ocean Sea Salt. "It’s not surprising, but this is our MOST POPULAR item, and the flavor that started it all." Crunchy, kinda fun to eat. These were very salty. But ... I want to like these more than I do. I love the concept, but this flavor isn’t really that great. Too simple. Update Review: I really, really want to like these, but they aren’t quite interesting enough. 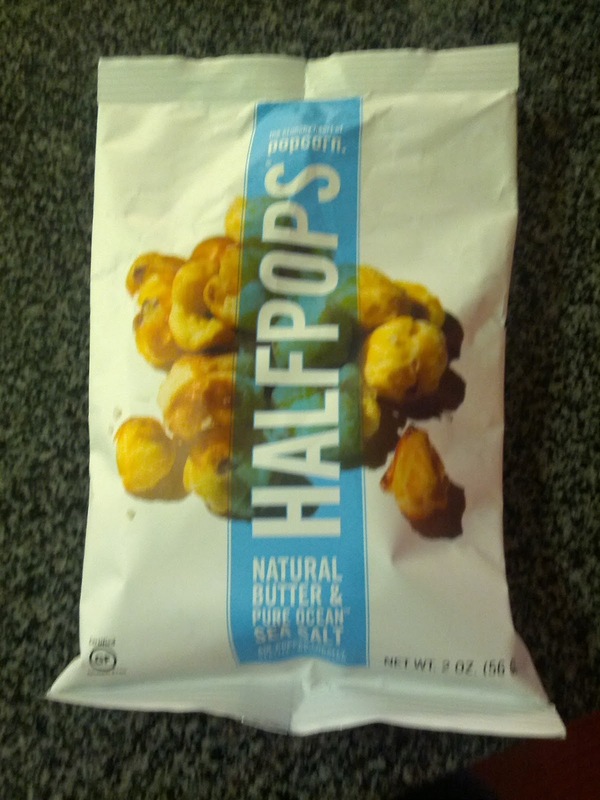 Not enough butter nor salt flavor to really … pop. Another Update Review: These are growing on me, but still not that great. I love the crunch, just wish the flavor was better. Final Update Review: Taste almost burnt, too crunchy, not enough that are ... half popped. "Did you know there is actually a fear of cheese? It’s true; it’s called TUROPHOBIA! To all the people with Turophobia out there, you probably want to pick another flavor." Nice cheddar flavor, better than butter and salt version. 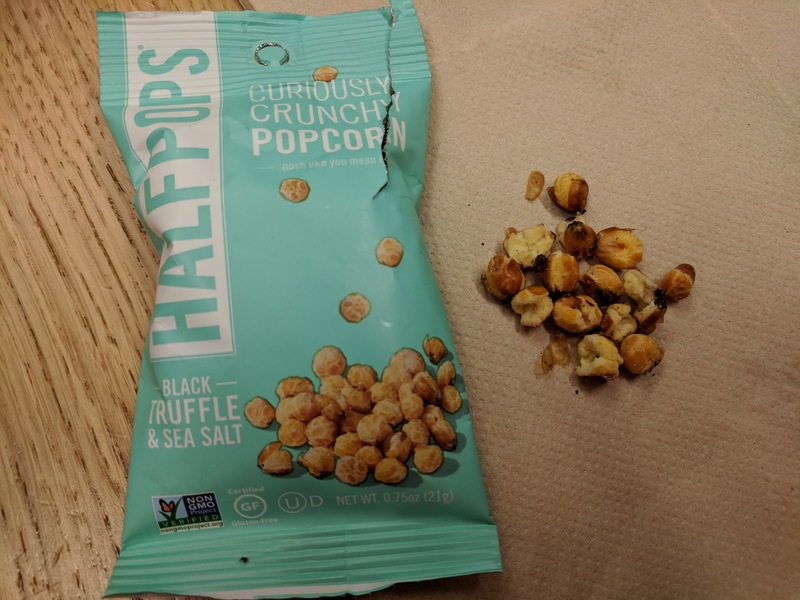 Crunchy, pretty decent. Update Review: Wish these were better. I want to love them, I like the crunch, I like the cheddar, but they fall short. Not enough cheddar flavor. Another Update Review: Decent cheesey flavor, very crunchy, not bad. Final Update Review: Ok, I'm over these. Too crunchy, not enough flavor, not enough cheesyness, just not great, no mater how much I want them to be. 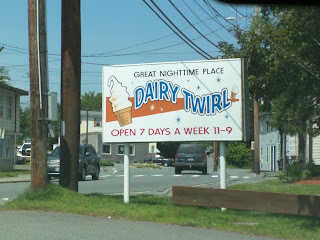 For more information about Dairy Twirl, and prior reviews, start with my original review. When I arrived in town in July and saw that lemon and mint were back on the rotation, I was overjoyed. My favorites! I didn't care that it was night and cold, I had been in town for all of 30 minutes, and I needed my fix. 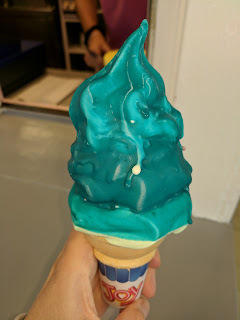 I didn't bother experiment this time around, and went right with my last recommendation: mint on the bottom, black raspberry in the middle, lemon on top, blue raspberry dip. While I wasn't thrilled that it was barely 60 degrees, aka, not ice cream weather for me, I did take this opportunity to get dip at a time when it wasn't going to melt and make a crazy mess. Which, it didn't. I'll start with the dip. 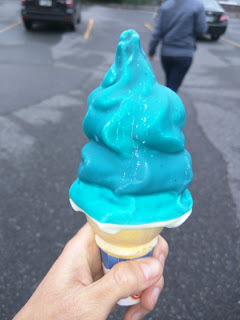 I really love the blue raspberry dip. It really does have a great flavor, and every single time I get such stares. "Mommy, her ice cream looks really weird", one little girl said as I walked by today. The dip went great with the lemon, which I put on top, to maximize contact with the dip. I again loved the lemon, again a bit strange since I don't generally go for lemon desserts, but, this was great. My favorite of the flavors. The black raspberry was good too, always a solid choice, and it went nicely with the lemon, and with the dip. The mint was actually my least favorite of the mix, and didn't go with the dip at all. I think mint is best for chocolate sprinkles, or, as my mom does, layered or swirled with chocolate soft serve. Blueberry (top), Maple (bottom), Chocolate Sprinkles. Half-Small. (August 2018) . On this visit, the additional flavors were blueberry and maple. Given that I had maple the day prior at King Kone (my favorite soft serve ever, although the maple wasn't life changing), and had plans to get a maple creamee at Mac's Maple the next day (where they make syrup and real maple soft serve that is intensely maple), I wasn't exactly excited about the maple. And I knew I hadn't loved the blueberry before. I tried the flavors first, asking to try the blueberry and maple, and received a sample of the twirl. Doh. I wanted to taste separately. I tried to distinguish between them when swirled, but I couldn't get a good enough taste of the maple in particular, so asked to sample them separate. I didn't love either, but I also knew I didn't want chocolate or coffee since I don't really care for them, and I knew the vanilla would pale in comparison to the King Kone vanilla, and just wasn't feeling black raspberry, so I opted to get them anyway, just not swirled. The blueberry was fine. It was ok creamy, but nearly as amazing as King Kone. It didn't taste like blueberries, but was kinda fruity, and sweet. Fine, but certainly not great. The maple was about the same. Again, ok creamy, but not nearly as amazing as King Kone. It didn't taste that much like maple, certainly not like a real creamee made with syrup like Mac's Maple. But it was sweet, and a different sweetness than the blueberry. I certainly wanted more intensity. On my next visit, the flavors of the week were Strawberry & Peanut Butter, which thrilled me, as I adore peanut butter ice cream (or even froyo), and I hadn't ever tried it from Dairy Twirl before. From these flavors, they had three specials: The PB & J (strawberry and peanut butter layered), The Neopolitan (chocolate, vanilla, and strawberry layers), and, the Peanut Butter Cup (chocolate and peanut butter layers). 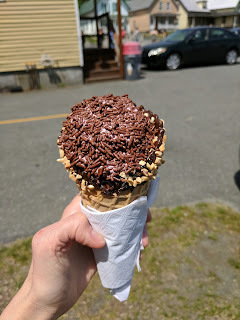 One of my companions went for the Peanut Butter Cup, which featured chocolate in the base of the cone, a layer of peanut butter, a layer of chocolate, and topped with peanut butter. He was quite pleased. As I don't care for their chocolate soft serve, this one wasn't for me, but I understand why it sounded like a winner. My sister one-upped him, getting hers with chocolate dip, but, alas, I didn't get a photo. This was a very generous sized half-small, given the 4 layers! Chocolate, Peanut Butter, Vanilla. Small. Another companion designed her own, with the chocolate and peanut butter, but also vanilla on top. She deliberately crafted it to have chocolate at the base so she could have lots of chocolate ice cream, and she too was quite pleased with her creation. I ... was less successful than the others. I had many creations in mind, but I sampled the strawberry and didn't care for it at all (it didn't really taste like anything fruity, but at least it didn't taste medicinal and fake like I thought it did when I tried it the previous year), so I ruled out all creations that would have strawberry. I tried the peanut butter, so ready to adore it and ... it just didn't really taste like much either. No strong peanut butter flavor. It wasn't bad, but it really just seemed like vanilla. I really wanted more intense peanut butter flavor. I guess this is what you get when the flavors are just done via syrups or powders or whatever they use. I have often felt that this style just doesn't ever really satisfy (like the peanut butter and other flavors at Fore-U), whereas flavors made with real peanut butter like King Kone are remarkably different. So I asked to try my total fallback, classic black raspberry, even though I always feel the black raspberry isn't as intense of a flavor as I want either. And ... yeah. It was fine, sweet, but didn't really taste like black raspberry at all. There I was, knowing I didn't want the chocolate or coffee, disliking the strawberry, finding the black raspberry and peanut butter very boring, and knowing vanilla wouldn't exactly liven up the party. So, I decided to hedge my bets with both, but I knew that I didn't want peanut butter and black raspberry adjacent to each other, so I added a separator of vanilla ("a thin layer of vanilla to separate", I specified). I put peanut butter at the base since it was the best of the three (... I think), and I knew that portion would be the largest. And then the mediocre black raspberry on top. But I knew that wasn't going to be interesting enough, so I added the blue raspberry dip since I liked it previously. The result? Well, three flavors of not very flavorful mediocre soft serve, all creamy like ice cream and not froyo, but not nearly as rich and creamy as King Kone or Mac's maple, and since I had those just the days before, I found myself pretty disappointed by this. They also did have small ice crystals. Just, well, really mediocre ice cream. The blue dip I thought would be my saving grace, since I loved it so much before and thought it tasted strongly like blue raspberry slush puppy, but ... it was just waxy and not flavorful either. Sigh. Overall, just not a great ice cream, and it made me more grumpy than happy. "Add an extra crunch to your ice cream with this topping, and it's sure to enhance the appearance of any soft ice cream swirled atop a cone. Featuring the pink, blue, and purple colors of standard cotton candy varieties, this topping will turn any ordinary ice cream serving into an extraordinary dessert treat!" I've kinda turned into a sprinkle snob these days, but I love some kind of crunchy coating, so I wanted to try other options for my cone. Unfortunately, Dairy Twirl's toppings lineup (besides rainbow/chocolate sprinkles, and dips), are all large candies or sauces, neither of which is what I was looking for. I wanted something like little crushed nuts, crushed waffle cones, or, even better, something like the incredible "Crunch Coat" they have at King Kone (my favorite soft serve anywhere). The only topping that sounded like it had potential of being the texture and eating experience I wanted was the "Cotton Candy Crunch". It was not available on a cone though, only on a dish, or, as I asked for it, just on the side. What was it? Well, sugar. 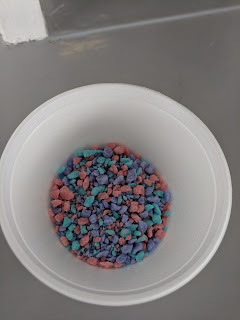 I thought it would be more like rock candy, but it wasn't crystalized like that, instead, just colorful pellets. It was very sweet, as you'd expect. It didn't really taste anything like cotton candy though. Cute, colorful, sweet, and yes, when I added it to my cone, did give me a fun texture, but, it wasn't actually remarkable in any way, and not something I'd really want again. Many years ago, there was an oil company in Lebanon, NH called Pete & Rogers. At some point, circa 1975, it was turned into an ice cream stand. I'm pretty sure the ice cream stand was called Dairy Twirl from the start, yet, the locals all still called it Pete & Rogers. I remember this being very confusing when I was a kid. "Who wants to go to Pete & Rogers? ", folks would say, and then we'd wind up at Dairy Twirl. I don't think I ever questioned it, as I was getting ice cream, but, now that I think about it, it is pretty confusing. I think it has changed owners a few times over the years, but, not much has changed. Anyway. 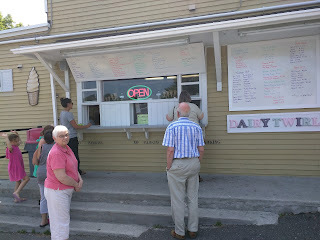 Dairy Twirl is the ice cream stand in town. 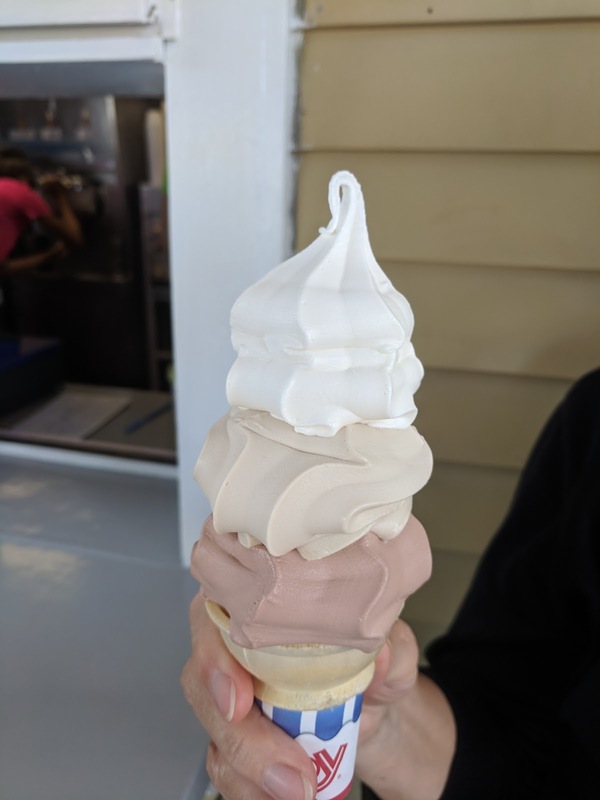 Technically, there is one more option, located at the mini-golf course in the adjacent town, and of course places like McDonald's do serve ice cream, but, really, Dairy Twirl is the place to get ice cream. No question. Menu: ice cream, shakes, sundaes. Dairy Twirl is a quintessential east coast ice cream stand, open only seasonally, generally memorial day through labor day. They offer ... ice cream. Nothing else really. No token hot dogs or anything like that on the menu. Just ice cream. It is not house made, it is not artisanal. It is just ice cream. But it is good ice cream, and they do a few things to set themselves apart from most other ice cream stands. Anyway, I digress. Dairy Twirl actually has an extensive menu of hard ice cream, all made by Hershey. I've tried a few when others have gotten it, and, yup, standard hard ice cream. They also have a couple hard frozen yogurts and I think a sorbet or a few non-dairy options. But again, I go there for the soft serve. Dairy Twirl has 6 flavors at a time, including 4 standard flavors (vanilla, chocolate, coffee, and black raspberry) and 2 that change weekly. Most other soft serve establishments only offer 4 flavors at a time, so, bonus points to Dairy Twirl for offering 6. 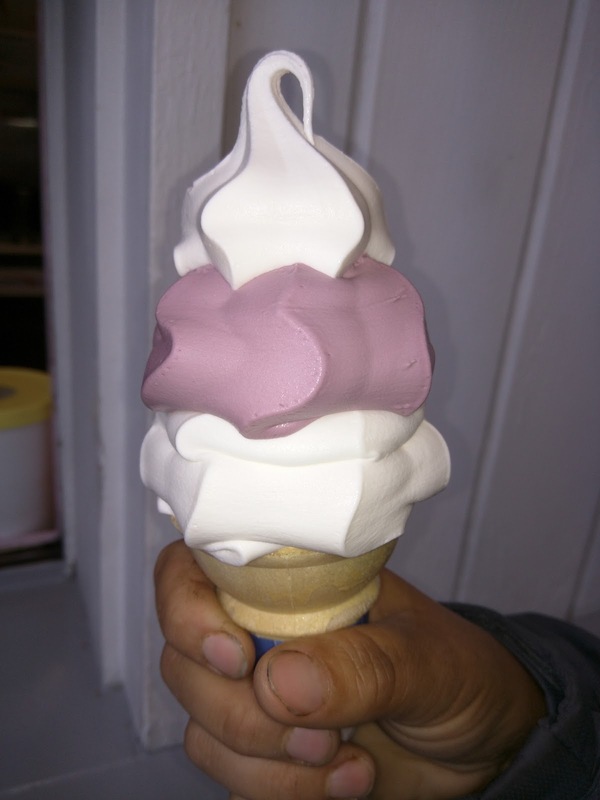 Lilac Soft Serve: Black Raspberry and Vanilla. Half-Small. The soft serve base is Hood. They use the 10% milkfat base, not the 5% seen at other shops around town. You might think you want the healthier version, but I assure you, that milkfat really makes a difference. Dairy Twirl soft serve is by far the creamiest around. Like most shops you can get any two that are on the same machine swirled, but, unlike most shops, they also offer layered versions with any flavors from any machine. In fact, they even suggest these on the menu, like, the "Lilac" pictured here, a layered version with vanilla and black raspberry, or a mocha with chocolate and coffee, or the "Thin Mint" with chocolate and mint. So, if you want vanilla and chocolate, but not swirled together, you could get them layered one on top of the other too. I love this, as it allows me to pick multiple flavors that don't necessarily mix together perfectly in a swirl. Oh, and they don't just layer them once. In the smallest size, if you pick two flavors, you get two layers of each. If you get the next size up (which is actually the small), you get 6 layers! Oh, and you can pick more than two flavors. Even for the smallest size ice cream, you can pick up to three flavors. I know making cones like this is more work, but, I absolutely love that they do it. Another reason I love Dairy Twirl is that they are always happy to let you sample a flavor or two. I know which of the standard flavors I like, but, it is always good to try one of the weekly specials before ordering. In addition to standard cups, cones, and waffle cones, you can also get a shake, float, sundae, or "razzle", which is just soft serve blended with toppings. Sizes range from half-small to pints and quarts. Do not be fooled by the sizes. A "half-small" is still considerably larger than most mediums in the rest of the world. It is certainly not a child sized, but, no "baby" cone is available here. For years, the "half-small" was not listed on the menu, although everyone knew you could order it. Now they actually list it. Soft serve is cheaper than hard serve, which I really appreciate, as it is cheaper for them to make, store, etc, but most places charge the same. And, that is it. (Ok, they sell bottles of water and frozen dipped bananas too). When I was younger, they also had slush puppies, and made a creation that was soft serve added to a slush puppy, like a float, but with slush puppy instead of soda, and a soft serve swirl instead of a scoop of ice cream. I forget what they called these, but I loved them, and that was my standard order back in the day. Blue raspberry slush puppy with vanilla soft serve. So amazing. Sadly, they no longer offer these, but, the soft serve is great enough that I don't mind. 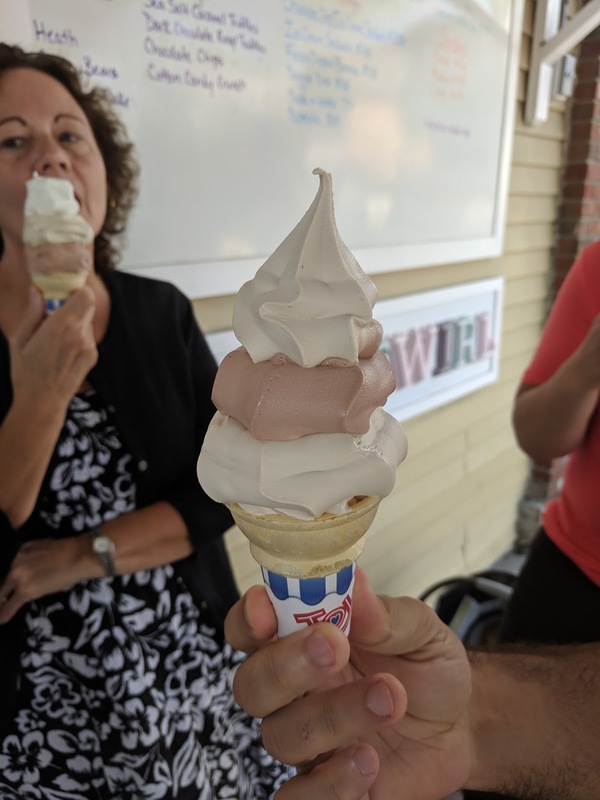 Dairy Twirl is an institution in town for good reason, and I hope it continues to thrive so I can always get in a few cones while I'm home in the summer. But, warning, yes, you will wait in a line, and yes you will be eating your non-artisanal ice cream while standing in a parking lot. And, if you are like me, you'll love it. The sign out front was changed several years ago, and always makes me laugh. "Great Nighttime Place" it boasts ... open until 9pm! Ahh, small towns. Gotta love them. Dairy Twirl is an ice cream stand. It is not a restaurant. You order at a window. There is no where to go inside. No bathroom. The window is adjacent to a parking lot. 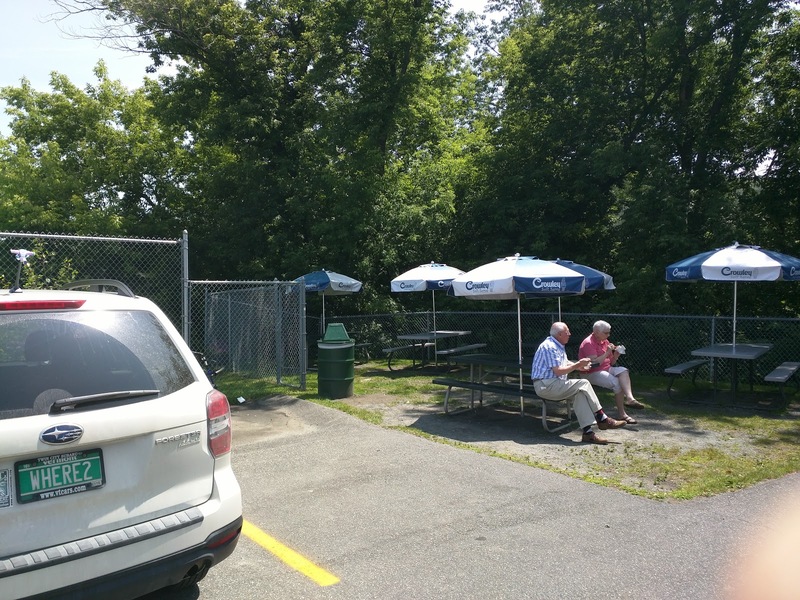 They did add a few picnic tables a while back, but they are down on the other end of the parking lot. As you can see, no frills here. You don't go for the ambiance. You go for the ice cream. It is always busy. I laugh when we drive by on a cold day, or a rainy day, and see the crowds. But, you know what? We join them. 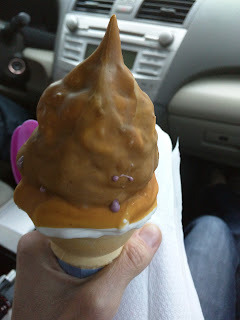 On a recent visit, I really wanted "one last Dairy Twirl", so, even though it was cold and raining, my family went, and we just ate our ice cream in the car. There are some picnic tables off near the back of the parking lot. Some people do congregate there, but others just go sit in their cars to eat the ice cream, or stand around the steps out front. I've had more ice cream cones from Dairy Twirl than I can possibly count, and I certainly haven't taken notes or photos every time. The following is just a collection of ones I happen to have. Summary though: get dip or sprinkles, get more than one flavor, and certainly don't get bigger than a half-small. The ice cream is always perfectly creamy, never icy, and exactly what I want. Mint with Chocolate Sprinkles, Half-Small. $2.25. Mint is one of my absolute favorite flavors they offer. Like all of the ice cream, it is very creamy. The mint flavor itself is, well, minty. It is fairly strong, and a bit refreshing. My mom always combines the mint with chocolate ice cream, the signature "Thin Mint", but this is one where for me, simple is better. I just want the mint. Mint is the flavor that challenges my general approach to ice cream at Dairy Twirl. While I normally want to combine multiple flavors in my cone, mint is the only flavor where I'll actually settle on just one, as I like it that much. I also forgo dip and go for sprinkles, chocolate. The combination of creamy mint and chocolate sprinkles is perfect for me, sorta like mint chocolate chip. And Dairy Twirl coats the cone perfectly in sprinkles. 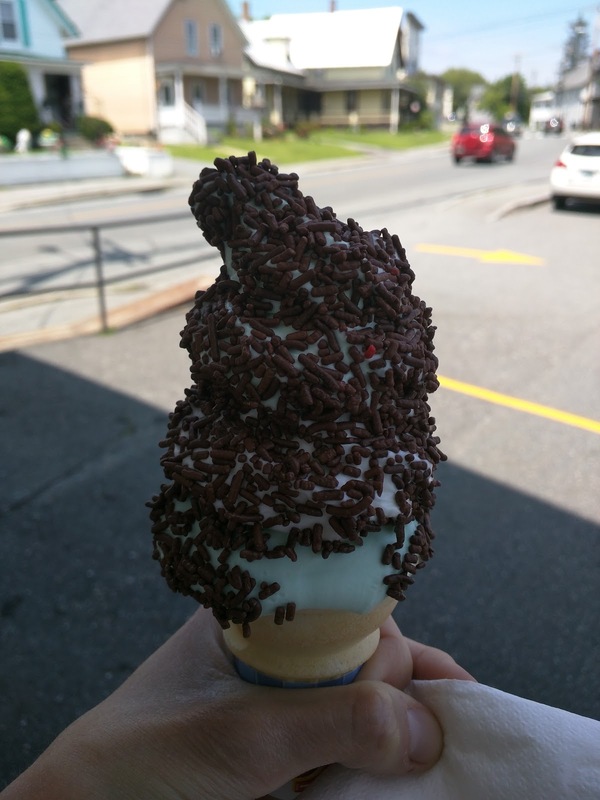 Mint, with chocolate sprinkles, is a very solid choice, and I'm always thrilled when they have mint on rotation. Like all half-smalls, this was $1.75 for the ice cream, $0.50 for the sprinkles. Mint and Vanilla with Chocolate Sprinkles, Half-Small. $2.25. On my next visit, I decided to mix vanilla with the mint, just to try something a bit different. This gave me 4 layers, 2 vanilla, 2 mint. It was fine this way, and it was kinda nice to have something besides just mint, but, the vanilla didn't actually add anything to the experience. 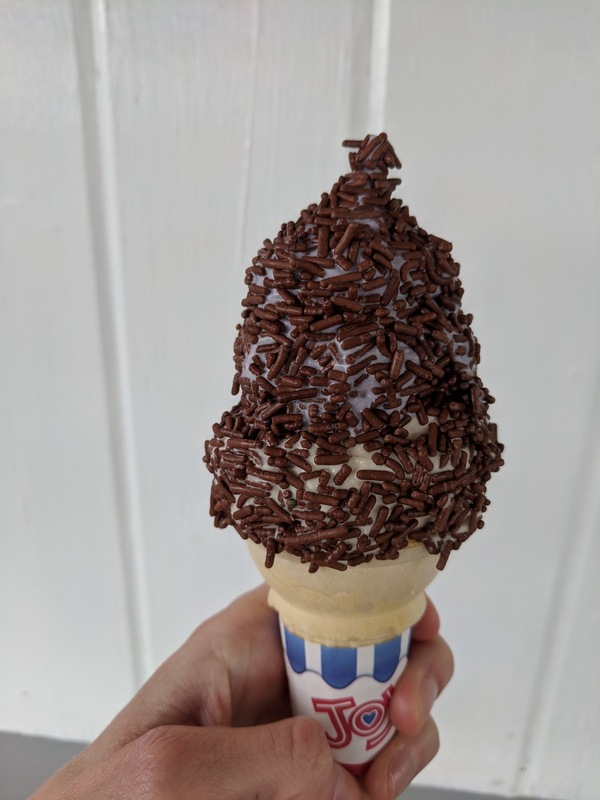 Note: The folks working at Dairy Twirl generally make perfect cones every time, layering the different flavors like experts, and dipping them perfectly in dip or sprinkles. I think this is the only time I've ever seen a not perfect job (and really, it wasn't that bad). Red, White, & Blue! (Forth of July Special), Half-Small. $1.75. 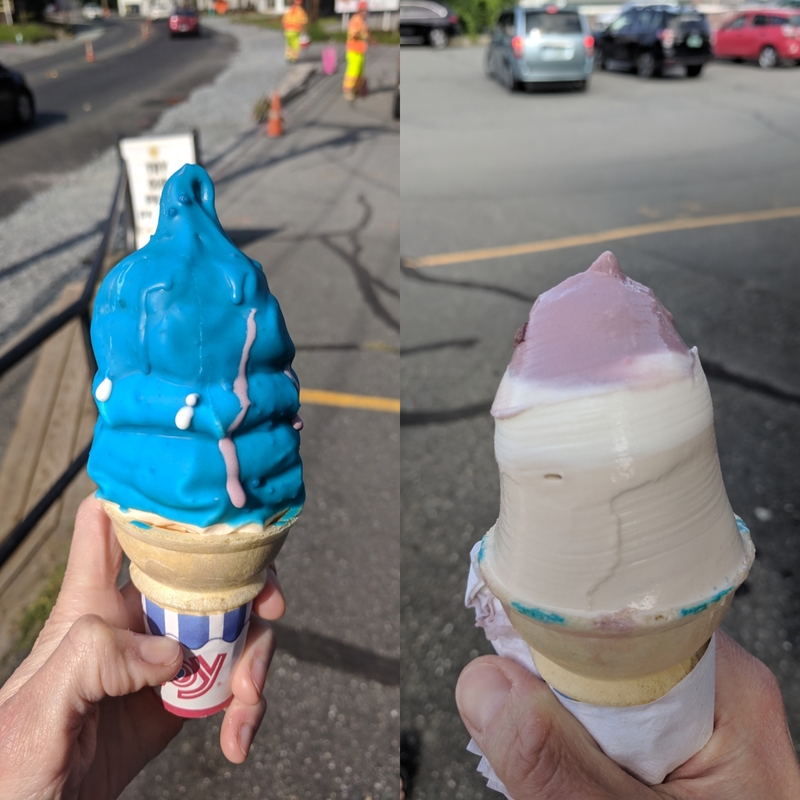 On the 4th of July, my mom went for the special "Red, White, & Blue", with strawberry at the base, vanilla in the middle, and blueberry on top. I have to admit, it looked great, and everyone in line was very interested in what she had. I asked to sample the blueberry and strawberry before deciding on my flavors though, and I'm glad I did. The strawberry, while vibrant, didn't have very good strawberry flavor, it tasted a bit fake. The blueberry, also quite vibrant, tasted more like blueberries, but it still wasn't awesome. Better than strawberry, but not high on my list. My mom agreed once she tried her cone, but, enjoyed it regardless. Blueberry, Vanilla, Black Raspberry, Coconut Dip, Half-Small. On the same 4th of July visit, I learned that I could pick not one, not two, but THREE flavors for my half-small. It made decision making so much easier. My choices were vanilla, chocolate, coffee, and black raspberry as always, plus the strawberry and blueberry my mom had. Since I don't really like chocolate or coffee, and I didn't like the strawberry, I decided not to put any more thought into it, and just go for the other three. 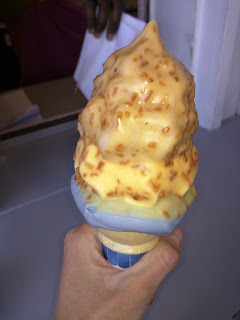 I did care about the order in the cone though, because I wanted to try a new dip, and opted for coconut. I decided the black raspberry would go best with it, so I wanted that on top, since it would come in most contact with the dip. All flavors were about as I expected. The ice cream was super creamy and melted perfectly in the 80 degree weather. Just as fast as I could eat, but not too fast (well, it was way too fast when the shell was still on, which of course turned into a sticky mess). The black raspberry wasn't as flavorful as I'd like, but it was still good. The blueberry had good flavor, but, again, just not one I was super excited about. The vanilla was solid vanilla. No earth shattering choices, but, all fine. The coconut dip looked great, loaded up with shredded coconut. However, it didn't have that much coconut flavor in the dip itself, it was just kinda sweet and waxy. I still enjoyed this cone, but, it wasn't one of my favorites. Black Raspberry, Chocolate, Vanilla with Peanut Butter Dip, Half-Small. On my next visit, I wasn't excited by any of the flavors - strawberry and blueberry were still the extra flavors. I sampled the coffee flavor, and found it fairly flavorless. So, I went for the other three classics, although I wasn't particularly excited about any of them either. I decided to make my ice cream more interesting by adding peanut butter dip, and, asked for the chocolate and vanilla on top as they'd best compliment the peanut butter. But, since chocolate and vanilla are kinda boring, I put black raspberry on the bottom as well. All flavors were creamy and melted nicely. The peanut butter dip was ok, not as intensely peanut buttery as I remembered from the past, but, still some extra flavor. As always, I didn't really like the chocolate ice cream, but, it went decently with the peanut butter. I did make the mistake of putting the chocolate in the middle though, and it did not combine nicely with the black raspberry. The black raspberry was my favorite of the flavors. Overall, this was fine, but, not a particularly great combination. Lemon, Vanilla, Mint. Chocolate Sprinkles. Half-Small. On this visit, the special flavors were lemon and mint. Of course, I tried both before committing to my selections, even though I knew I loved mint, and I knew I never like lemon desserts. Best move ever. The lemon ice cream turned out to be absolutely amazing. It was sweet, a bit tangy, creamy as always, and just really, really good. I was shocked, and didn't know what to do. I loved it. But I also love the mint. And I didn't think mint and lemon would work very well together. So, what's a girl to do? Get them both, and add a separator. I put the lemon on the bottom, since I knew that is the flavor I'd get the most of, and, well, I liked it the best. I loved it. I added vanilla next, just as a separator. It felt like a waste, and I was tempted to say, "a very small portion of vanilla", but, I decided not to be even more complicated. The vanilla was fine, but just vanilla. It did its job separating my two real choices. On top went the mint. It was minty, creamy, and great as always. I added chocolate sprinkles, as I wanted something to compliment the mint, and I just wasn't feeling chocolate dip that day. The chocolate sprinkles were perfect with the mint, and helped add a bit of flair to the otherwise boring vanilla. Mint, Black Raspberry, Lemon. Blue Raspberry Dip. Half-Small. The next day, my family went out to a big lunch at 4 Aces Diner. We were all stuffed. It was also cold and raining. And my last day in town. I didn't care that it wasn't "ice cream weather" and that I didn't need more food. I wanted more lemon and more mint ice cream. I couldn't leave without getting them again. I was perfectly satisfied with my previous creation of lemon on bottom, vanilla divider, mint on top, with chocolate sprinkles, but, I wanted to get even crazier. Rather than vanilla divider, I decided to try black raspberry. Black raspberry is a flavor I enjoy on its own, and I thought that lemon and black raspberry would go well together, and mint and black raspberry might not be awful. I knew they wouldn't be the best match, but, I really wanted something other than vanilla. And then ... I added the crazy blue raspberry dip. I had wanted to try it for years, but couldn't come up with a flavor combination it made sense with. But lemon and blue raspberry sounded great and black raspberry and blue raspberry sounded fine. Mint and blue raspberry, well, no, but I'd put the mint in the bottom and it wouldn't touch the blue raspberry much. This was an excellent design. The mint on the bottom meant that I had basically a plain mint cone at the end, satisfying on its own, creamy, and always a favorite. The black raspberry and lemon were wonderful together, both complimenting each other well, and both just as good as always. They also started my eating journey on a fruity note, before diving into the mint to finish. It was a nice progression. And the crazy dip? It looked awesome (and got me a LOT of stares as I walked away with it), and, it was awesome. Like my old favorite Slush Puppy flavor. It was perfect with the lemon and good with the black raspberry. Black Raspberry and Vanilla, Peanut Butter Dip, Half-Small. $2.25. Sometimes, even I'm not a pro at making ice cream choices. This was one of those times. I blame the cold weather (the reason I was eating this in the car). 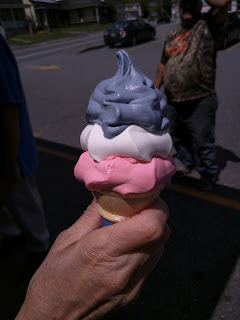 I knew I liked the black raspberry soft serve the best. I also knew I liked the peanut butter dip. So I combined them. 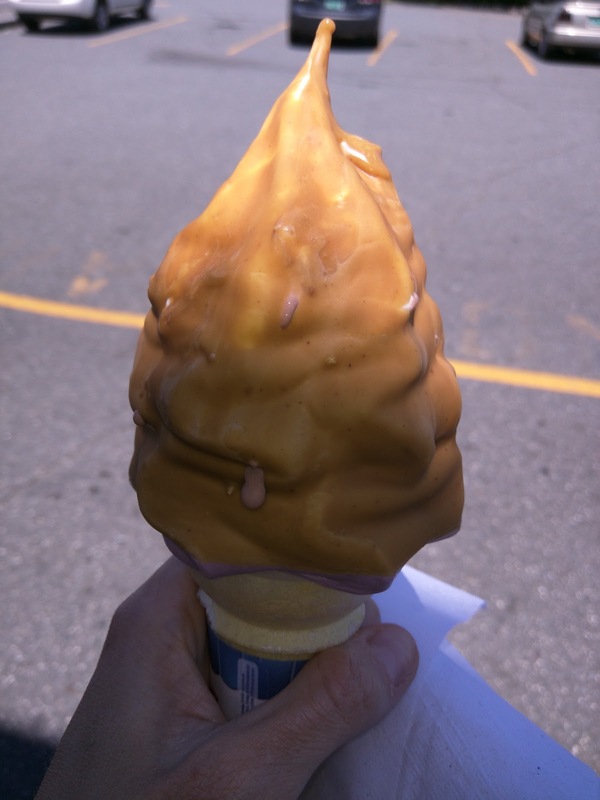 I did put vanilla on top, so it would come most in contact with the peanut butter dip, but, I still had a fair amount of black raspberry and peanut butter combining, which, just didn't work great (it does sound a bit like a peanut butter and jelly, but, alas, no). Note to self: don't mix black raspberry and peanut butter dip! Black Raspberry, Vanilla, Orange Pineapple. Rainbow Sprinkles. Half-Small. $2.25. 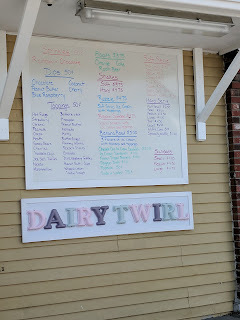 Dairy Twirl makes names for all of the layered creations, such as "Barney" for pistachio and black raspberry, "Pancake" for maple and blueberry, etc. 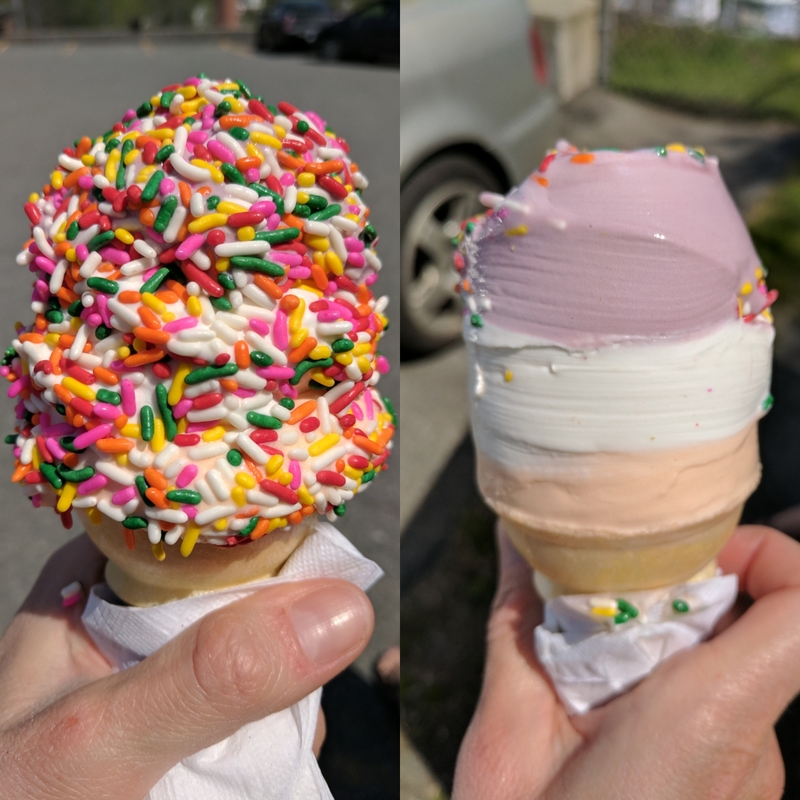 Two of my mom's favorites are the "Lilac" with black raspberry and vanilla, and "Creamsicle" with orange pineapple and vanilla. I decided to combine them both, with the vanilla serving as the layer between. This was a nice combination. The black raspberry and vanilla went well together, the orange pineapple and vanilla went well together, and I'm not sure the black raspberry and orange would have been nice together, so having them separated was good. All the flavors were creamy and melted perfectly. I added rainbow sprinkles because it was very hot out and I was worried about it being too hot for dip, and I still wanted something, and they were fine. Overall, a decent choice, and a good one for a time when the flavors available weren't my favorite. 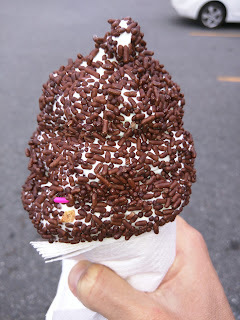 Black Raspberry/Vanilla/Orange Pineapple, Chocolate Sprinkles, Chocolate Peanut Coated Specialty Waffle Cone, Half-Small. $3.75. The next day I returned, and, alas, the flavors were the same. I tried the coffee flavor (fine, but not for me), and decided to just get the same cone as the previous day. But I couldn't really get the *same* cone, right? I wanted to add dip, but it was 90 degrees, and I knew that was a recipe for disaster, as the ice cream would melt too fast and I'd turn into an ice cream covered mess, and my mom would threaten to wash me down with a hose (yes, some things never change). I swapped my rainbow sprinkles for chocolate, since chocolate sprinkles go better with black raspberry, which I was putting on top. And then ... I swapped out my standard cake cone for a specialty waffle cone, dipped in chocolate, and coated with peanuts. Why did I go for this cone? While, they were on display right in the window, and looked appealing. I also had the choice of just chocolate dipped, or with chocolate or rainbow sprinkles, but nuts were the most unique. I also picked this cone because, well, I actually hate cake cones. They generally taste stale to me, I hate how they get soggy, and it always feels like eating styrofoam. But I prefer my soft serve in a cone, as I like the experience of licking it. Which means I always hit a point of profound disappointment when I hit the cone, not for the reasons that most people get sad because their ice cream has run out, but rather, because I know that I have to deal with either eating the cone I hate, sacrificing some ice cream, or somehow digging it out. I figured if the waffle cone was good, then I could solve this problem. Of course, the waffle cone was HUGE. Even though I still ordered a half-small, you couldn't really put a half-small in this cone, it would look ridiculous. My mother ordered a regular small dish, and there was certainly less in her dish than in my cone. The volume of this thing was ridiculous. We concluded that it was at least the same amount of ice cream as a medium. My mom had finished her entire small before I even finished the top layer of mine. It took effort, but, I finished it. I felt extremely accomplished, and, uh, had quite the stomach ache. So how was it? The cone itself was better than the cake cone, but still just a Joy brand standard waffle cone, not homemade. The chocolate coating was fine, the peanuts added a bit of crunch, but, there was really nothing special about it. The bigger problem is that it was hard to eat. I want a cone for the licking purposes, and this wasn't lickable in the same way. So, I failed to achieve the most important part of eating a soft serve cone for me: licking around it, as it melts, in the sun. It also didn't allow me to experience the mixed layers. I could only reach the black raspberry at first, and then the vanilla, and then the orange pineapple. 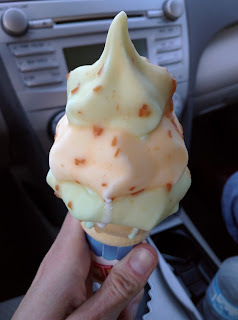 I like the mix of orange pineapple and vanilla, a la creamsicle, but it wasn't possible to ever get to both in the way it is in a regular cone. Same with the black raspberry and vanilla. $1.75 for half-serve + $0.50 for sprinkles + $1.50 for specialty waffle cone. The toppings list is extensive, with all sorts of chocolate candy (M&Ms, Snickers, peanut butter cups, kit kat, etc), gummy candy (gummy bears, gummy worms, etc), fruit (pineapple, strawberry, etc), sauces (fudge, caramel, butter scotch, peanut butter, marshmallow), and of course whipped cream, cherries, and nuts. I've actually never seen anyone get any of these. The toppings people do get? Sprinkles of course, and both rainbow and chocolate are offered. And ... dips. 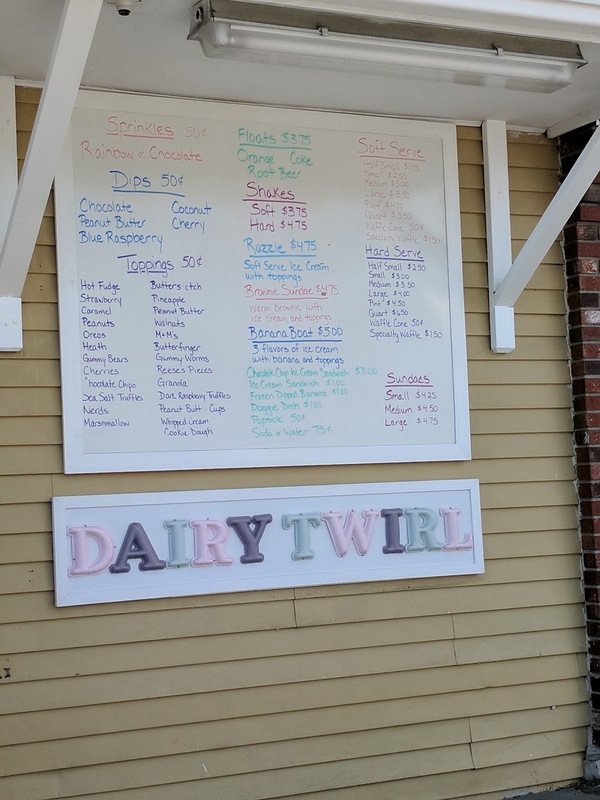 Dairy Twirl also stands out in this area, offering not just chocolate and cherry dip like most places, but also peanut butter, coconut, and blue raspberry! Sprinkles and dips are both $0.50 to add on, and totally worth it. I tend to go for the dips, because they are more novel and rare, but, they do require care and caution when eating on a hot day. Soft serve melts quickly, and when you can't get to it to lick it because of the dip shell, it can cause quite the runny mess very quickly. On hot days, or when I'm particularly wanting sprinkles, I'll go for sprinkles instead. I very, very rarely opt for no sprinkles or dip, as they genuinely add to the experience for me. "Creamsicle": Orange Pineapple and Vanilla, Coconut Dip, Half-Small. $2.25. Blue Raspberry: Stunning color! Sweet, and actually does taste a bit like blue raspberry. Amazing combination with lemon or black raspberry ice cream. The chocolate and rainbow sprinkles are standard sprinkles, no more, no less. Great for adding some texture and fun, but, yes, just sprinkles. Lemon: Amazing! I don't like lemon in desserts usually, so I don't even know why I tried this, but, I loved it. Slightly tart, sweet, and great lemon flavor. I really loved this, and it paired nicely with both vanilla and black raspberry. Mango: Didn't taste too fake, decent. Peach: Very creamy, very good peach flavor. A favorite. Pistachio: I didn't like this. My mom says it is too sweet, which wasn't my problem exactly. It was too ... pistachio flavored? Strawberry: Tasted a bit too fake. 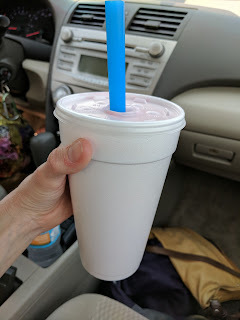 On one visit, my mom picked up a strawberry shake for someone else. I may have snuck a sip. The shake was, well, a shake. Strawberry ice cream and milk, blended. No topping was offered. It was served in a thick styrofoam cup with a large boba style straw. 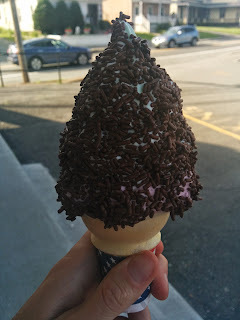 It took considerably longer to prepare than a cone, and was priced fairly high ($4.75 for hard ice cream based, $3.75 for soft). I guess if you wanted a shake this is a fine option, but I'm not sure why one would opt for this given the other options. Arrival: Boston, 5:37 (scheduled), 6:30 or so (actual, because, then we had no available gate. Because, sigh). I'll spare you a aircraft review, since I failed to take a photo anyway, and wasn't expecting to do a review. CRJ-900, an actual comfortable seat, with power outlets, USB, and even wifi. I was pleasantly surprised. Friendly efficient flight attendant. The flight experience itself was fine, save for all the drama ... broken nav system, no gate, etc, etc. The quick like 45 min flight turned into much more. But, I was pleasantly surprised by the cuisine. Before we took off our FA asked if we'd like a drink once underway, and she quickly brought them out once airborne. We were also offered a meal, which I was not expecting at all. It was all far better than I imagined it would be. The wine choices were a merlot for red, or a sauvignon blanc or blend for white. I went for the sauvignon blanc. It was actually not bad. Not acidic, not harsh, not minerally. Also not too sweet. 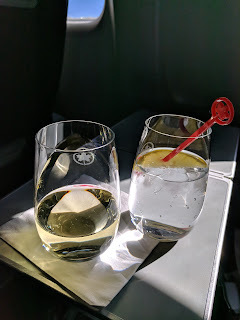 Really enjoyable, too bad our flight was so short that I couldn't really have a second glass! Smoked Salmon / Arugula / Potato Salad. 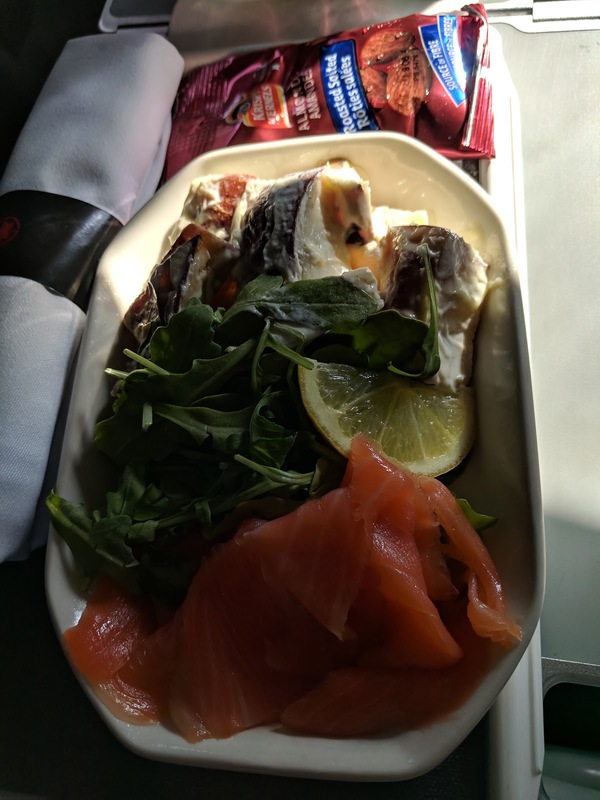 Along with drinks, we were offered a smoked salmon plate. I accepted it, mostly out of curiosity. I expected a tiny little appetizer or something. Instead, it was a generous serving of smoked salmon, paired with undressed arugula, potato salad, and a wedge of lime. The salmon I didn't actually care for, it wasn't smoky, and it was kinda fishy. The arugula was fine, but, with no dressing, I didn't quite have a use for it. But the potato salad? Uh, I kinda loved it. Big chunks of skin on red potato, cooked slightly all dente, slathered in a mayo dressing. It was crazy basic, literally no other veggies, no token chopped celery, chives, or anything. Literally, just chunks of potato in mayo dressing. I'm sure the dressing had slightly more than mayo in it, as it seemed sorta like mayo-cream rather than just mayo, but, it certainly wasn't seasoned in any way. And, we did not even have salt and pepper packets to jazz it up. Yeah. Crazy basic, generic, simple potato salad that needed seasoning. That I liked. I can't explain it. Sometimes I go nuts over seriously low brow potato salad or macaroni salad. Our trays also contained packages of salted almonds. Yes, Boloco is a burrito place, but I'm here to talk about milk shakes. If you care to read about the burritos, you can read my review of the lackluster burritos I had at a catered event. Boloco's menu is burritos, bowls, and salads. Yes. But if you read further, you'll find smoothies and shakes, all made with fresh ingredients. Totally random really, an odd match, but, I wanted to try them. 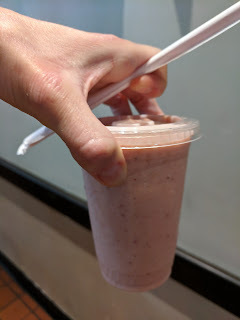 Shakes are available in only 4 varieties: 3 with skim milk and non-fat frozen yogurt as the base, the final one really is a smoothie not a shake, and I don't know why they list it otherwise, as it has no frozen yogurt, and is soy milk and fruit based. So yes, the "shakes" are healthy shakes, froyo and skim milk as the foundation doesn't scream decadence. The smoothies are built around fruits, fruit juices, vegetables, and raspberry sorbet. None actually sounded like a flavor I wanted. Because, well, healthy slant, not things like mini chocolate chip, although they do have a nutella version. So, I modified the most decadent sounding one I could find, in an attempt to make a "real" shake. The result wasn't great, but I'd still return sometime to try a new attempt, as the quality was high. Jimmy Carter Shake (Sub Strawberry for Banana). Mini. $4.50. "All-natural creamy peanut butter, banana, skim milk, non-fat frozen yogurt." It was a hot night, still 90 degrees at 9pm (! ), and I wanted ice cream. I went straight to one ice cream shop, but ... they had their freezers fail earlier that day in the extreme heat. So I fell back on froyo. I went to JP Licks, my old standby. And ... their soft machine had run out. They had hard ice cream and yogurt of course, but, I really like their soft serve, not their hard serve! So I decided a shake was in order instead, and ventured to Boloco next door, as I have a friend who raves about their shakes. The options were nutella, chocolate, vanilla, or the "jimmy carter", with peanut butter and banana. I opted for the later, but modified it, subbing strawberry, which I knew they had for the fruity smoothies, in place of the banana. I wasn't in the mood for banana, having had Magnolia Bakery banana pudding every day for 3 days prior (review coming soon! ), and the idea of a PB&J in shake form sounded appealing. It was no problem to make this change. I ordered the mini size, not listed on the menu in the store, but listed online, the size my friend said is plenty, and that too was no problem to do. The shake was made to order, all fresh ingredients, and took a while, appropriately. It was ... fine? But I really I wished I had left the strawberry out entirely, and just did a peanut butter shake. The peanut butter flavor was nice, it was well made, nicely mixed, creamy. But I wasn't into the fruity nature, certainly more berry forward than peanut butter, resulting in something that tasted a bit too much like a smoothie for me. The mini size was $4.50, and I agree, is all you need. The price seems high for such a small, unremarkable, item. I think simple vanilla would be better, or, really, I just need to return when I'm in the mood for something fruity.